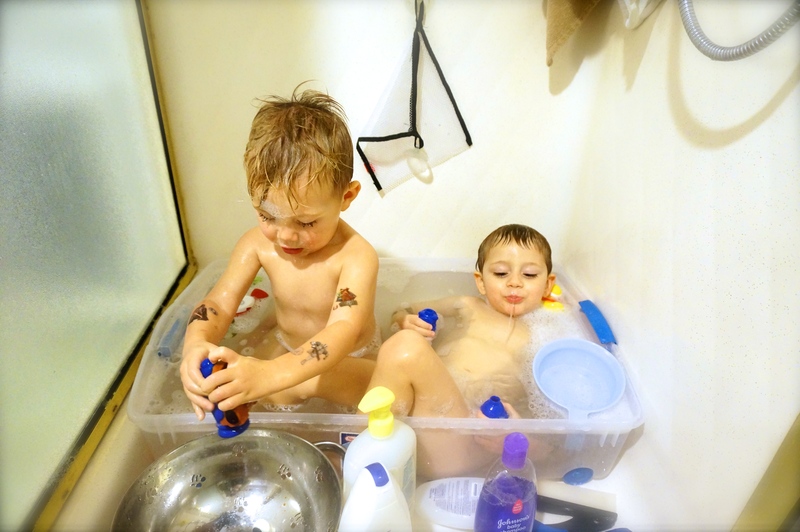 Is it weird our kids Bathe in a Rubbermaid Bin? When we moved into our current house we were SO excited for two bathrooms and more space (coming from a 680sq foot bungalow made our current 1,600 place seem HUGE).One thing that never entered our minds until we moved in is we don’t have a bathtub! This would not be a big deal if it we’re just the two of us, but with little kids a bathtub is kind of a necessity. With this house we refuse to do anything twice, which means that although we would love to put in a temporary tub, until we can afford to remodel a bathroom how we REALLY want it we are going to live with the 1960’s era prefab showers currently in the house. Besides, we think the boys will really appreciate these classy photos when they’re older. Have we mentioned our only form of heat is a wood burning stove? Thank goodness we live in Southern California!